Anderson Black by Premier Prints is a large black and white buffalo check that’s priced very affordably. This trendy check is great for curtains, tablecloths, bed skirts, and much more. It’s a drapery weight décor fabric, but it can be used for upholstery that isn’t heavily used. This 100% cotton fabric is washable. For a farmhouse kitchen soft Roman shade. I am making a duvet cover for a guest room. This will be perfect for the black, white and turquoise color scheme. I picked these items because the customer reviews were good and showed how big the squares were. The color my son picked for his room. I like the look of the material, that's why I picked this brand. I love Buffalo check in decor. I Love Buffalo print and neutral colors and the black and white is classic and goes with all decor. I love the crisp colors and bold look. I had a wing-back chair covered in this fabric and now want to have pillows for the adjoining bed! It's just perfect! Exactly what I was looking for for a drape in a display I am doing for Fall vignette! I was not able to find curtains in this material - do i decided to make my own. I purchased this fabric for the lining of kitchen urtain valances. I have been looking for a black and white buffalo check for awhile. Should have come here first!! 50% less expensive to one I found locally but there was only two yards left. I wanted a woven print that is the same on both sides rather than a stamped on print that only shows on one side. And because my daughter has been wanting me to do a sewing project for her...she liked the type of fabric and design. I love buffalo check print, and I think this will look great against with my emerald green walls for my studio space. Style was what I was looking for and had trouble finding elsewhere. Looking for a black with white not cream print for pillows and footstool. my friend has this on her bar stools.....really sharp! I am trying to copy a Pintrest table runner for Christmas dinner. THis is the only place i could find this print in a fabric other than flannel. Received the sample I ordered and it’s exactly what I was looking for. Perfect colors and fabric weight. We are redoing our kitchen which hasn't been updated in 37 years. 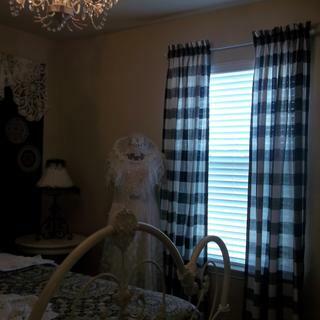 My inspiration kitchen had buffalo checkered roman shades. I knew I could make the same for less and this was exactly what I was looking for. I was looking for black & white buffalo check fabric to make some pillows & a tablecloth for my porch! I was shopping & noticed this was popular for spring & summer. 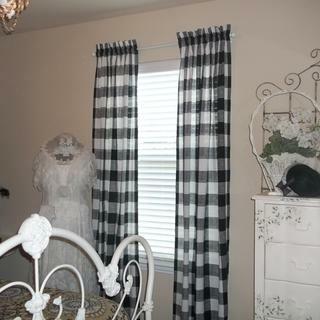 I love black and white buffalo check and think it will be the perfect backdrop for some beautiful red and white Christmas pillows this holiday season. Online Fabric had the best product at a terrific price! I have been looking for a wide check like this. And the price met my budget. Is this white white or off white with the black????? Thank you! BEST ANSWER: I bought this fabric a few months ago and the white is white. I love it! Thank you so much!!! I appreciate your time to answer. How large are the squares? BEST ANSWER: The squares are approximately 2.7" x 3". What size is the checks? Is this a woven pattern or printed? BEST ANSWER: This pattern is printed. I believe it is printed? But does look woven, very nice fabric! Squares are perfectly shaped and straight. Using it for curtain panels, possibly a couple of pillows! Hope this answers your question! Happy with my purchase. why can't I find this in gold? BEST ANSWER: Premier Prints doesn't make this pattern in gold. need 8yds for curtains will it be shipped in one piece? What does back of fabric look like? BEST ANSWER: It is white. The pattern is printed on the front only. Will this shrink? Should fabric be pre-shrunk? BEST ANSWER: Since this is 100% cotton, it will shrink to some degree. We recommend pre-washing fabric before you start your project to remove any finishes that may have been added in the manufacturing and shipping process, especially if it's something you know you will have to clean. I would be using this to reupholser wingback chairs. How easy is it to use duck fabric? I have heard that its a nightmare to use when reupholstering? BEST ANSWER: This fabric is suitable for many upholstery applications, but we do not recommend it for use on heavily used items. It depends on the specific duck. Heavy ducks or loosely woven ducks may be difficult to work with because they could be stiff or unravel easily, but this medium weight duck shouldn't be a problem. BEST ANSWER: Yes, we do! Covington Sandwell Red would be a great choice for a red and white buffalo check to be used on a sofa. I love Online Fabric Store! It's my go to for fabrics! Always a great selection and great service! Love how these curtains came out! The large checks makes it easy to measure cut. Thank you for your great service! Judy...from Texas! Very disappointed with the quality of this product. I was extremely unhappy with the quality of this product. It was not woven, the design was just screen printed on the fabric. And it wasn’t even a good screen print. I returned the fabric, and I am still waiting on a credit. I would never order this again. Good quality and easy to work with! This fabric worked beautifully for this project! 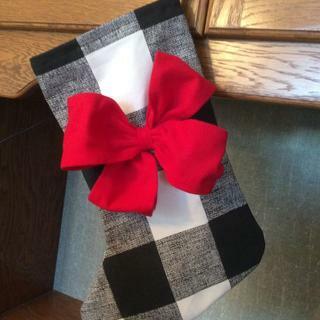 Christmas stockings (I made two) for the family pups!